Soft Spots on the Floor? A soft spot in the floor of your RV—whether it's a motorhome, pop-up, or camper trailer—is something you simply cannot ignore. The soft spot usually means a leaking roof or perhaps plumbing problems, either now or at some time in the past. Either way, a repair project is in your near future. But can a DIY owner handle an RV floor repair job? Of course you can, and I'll show you how, from start to finish. 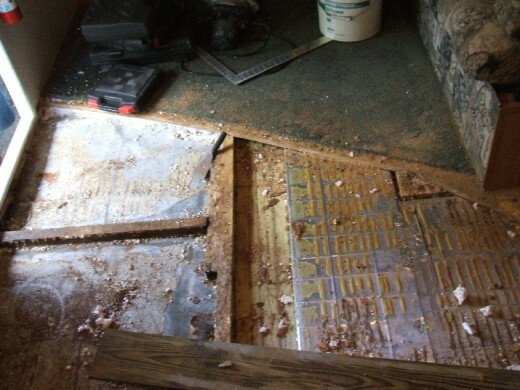 Dutchman travel trailer with a damaged floor. 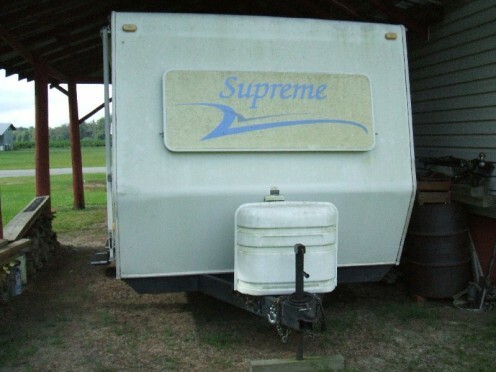 This Dutchman camper trailer had at least two previous owners and has been in the hands of the present owners for two years. Shortly after the purchase, soft spots were noticed in the kitchen area floor. These spots have gotten worse and have spread almost into the carpeted sitting area. The table base was screwed to the floor which was so soft the table was barely supported. At some time in the past, there was a plumbing leak. It is suspected a waterline supplying the sink or water heater had ruptured and soaked the floor. This was probably due to freezing temperatures while the camper trailer was left with the water hooked up. 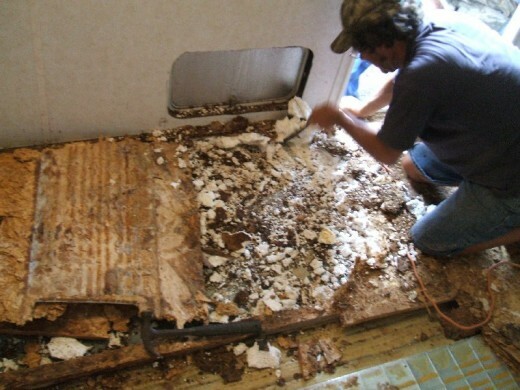 Whatever the reason, it thoroughly soaked the particleboard used as a base for the floor covering. 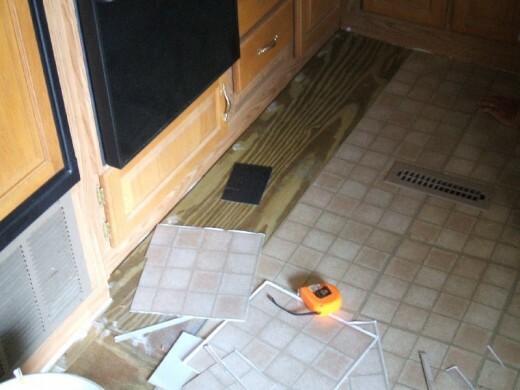 A look inside of the base cabinet revealed the original vinyl floor covering which had been replaced by vinyl stick-on tile. This quick fix might have been satisfactory on some models, but not in this case. Particle board is notorious for falling apart if exposed to water. In fact, it can swell just from the moisture in the air over a long period of time. Booth unscrewed from the wall and floor. Rotten wood and styrofoam removed. Floor cleaned and ready for repair. Joining point between new and old flooring. Before the floor could be removed, the table and booth had to be dismantled and stored elsewhere. The position of each bench was carefully marked and measured to ensure proper position when replaced. The bench with the back to the bar top contained electrical wires for the running light wires which were cut and would be spliced after the repair job was completed. The tiles pulled up easily, as the glue had deteriorated on the damp particleboard. After removing a section of particleboard with the reciprocating saw, it was easy to see what had occurred. The only support in the floor consisted of a few 1 ½ inch square wood beams with Styrofoam in between them. Beneath this was only thin metal over a few sparsely-spaced steel support bracing. There was a steel beam under the booth/table area which had not been used for a wood beam floor joist. Very poor management of floor support in this design. A reciprocating saw was used to cut the particleboard away from the walls and cabinets. Care is needed to keep from cutting through the outer sheet metal on the bottom. A floor heating ventran the length of the unit and was flattened by the weight of those walking on the soft floor. It was almost impossible to keep from cutting this aluminum vent during the floor removal but this is easy to repair. Tip: Cutting a straight line into the area separating the sound wood from the bad will make matching the new wood edge easier. The removal of the Styrofoam was the worst part of the job as it was glued to the metal covering and to the particleboard. A small scraper was used to remove the remnants and the whole area was vacuumed clean. 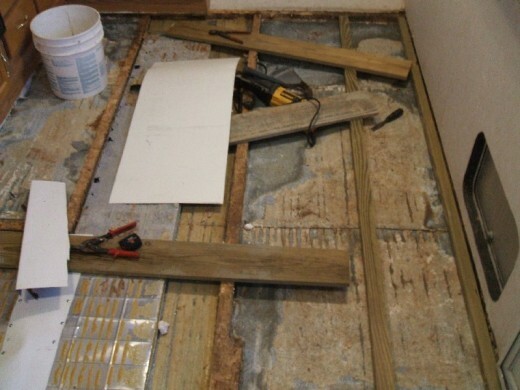 The stick-on tile had sealed the moisture into the floor and had slowly deteriorated the particleboard. There was no place for the moisture to go. This moisture had been trapped inside for years and finally the damage became noticeable. Corroded heat duct repaired with aluminum sheeting. Extra floor joists added. Insulation added and duct protected by roofing felt. Attaching the new plywood flooring with screws. Ready for the floor covering. After the cleanup, the rebuilding process begins. Extra wood floor joists were added over the steel beams beneath the floor. Joists were also added beneath the cabinets and along the line of the remaining floor at the sitting area. It is important to support every edge of the new plywood for greater strength and stability. Extra joists were screwed along the walls into the old, but still solid, wood beams. Cross beams were also added to further strengthen the floor support. The old heating vent was straightened and reinforced with sheet aluminum and self tapping sheet metal screws. Aluminum adhesive duct repair tape was used to seal all repairs and to repair the cuts made during floor removal. An extra wood joist was added along the side of the vent to prevent the damage happening again. 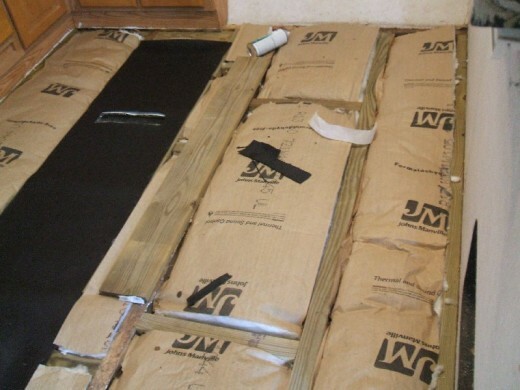 Roofingfelt was used to cover the aluminum heating vent because the treated plywood used for the floor replacement will corrode aluminum over a period of time. 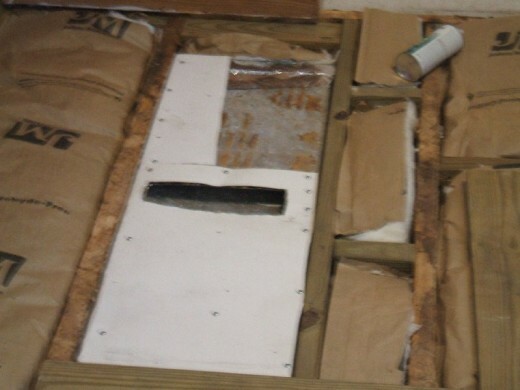 The Styrofoam insulation was replaced by ordinary thick fiberglass insulation. Any rusted spots on the floor was treated with a good quality paint to prevent further corrosion. Coated deck screws were utilized to attach the ¾ inch plywood to the beams and to match up with the remaining ¾ inch particleboard. The screws were countersunk and filled with putty so as not to show beneath the new floor covering. It may be necessary to sand or otherwise flatten out uneven areas, as these floors are hard to get completely smooth. Because of the many different angles and protrusions, stick-on tile was the easiest and most mistake-free covering to use. Unless you have a very square and angle-free area, it is hard to cut solid vinyl flooring without making a mistake. If you desire this type of flooring, it would be best to hire a professional to do the job for you. Ceramic tile is not recommended because of the flexing of the unit while in transport and because of the excess weight involved. Other coverings, including carpet and wood, may be used if desired. If vinyl tile is used, be sure to plan the edges carefully to avoid having to cut tiny slivers of tile along the walls. The molding will only cover about ½ inch when put down. A carpet bar or wooden threshold may be used to cover the joint between the new wood and the old. Often, this joint is uneven because of the swelling of the old floor but the aforementioned products will hide the difference. It only remains to replace the booth and table and cover the cracks around the floor and walls with quarter round molding to dress up the new floor. The floor in your particular model may be constructed differently, but the method of replacement is basically the same. Use as much support as you can to support your new floor and you can enjoy the fruit of your labors for many years to come. Booth and table back in place. Joint between new floor and carpet. Any questions you have or problems you may encounter may be addressed here. Mykayla, this took my friend and I about 5 days to complete, including the new tile flooring. But then, we're accustomed to such projects. How long did this take you? Days, weekend, months? Denise, if it's a fiberglass or acrylic tub is will be rather flexible. I just bought a used camper and I would like to know if the flooring in the tub should it be soft or hard? Karen, I'm not familiar with how the couch is attached. If you'll send me a photo via email, I'll be glad to take a look. You can find my email by clicking the "Contact Author" icon at the top of this article. David, visit Lowe's Or Home Depot to see what activator is needed for you type tile. I's been several years since I last used an activator and there may be some improvements since then, Good luck on your repairs! Randy, just now seeing this article, my wife and i have a RV that received water damage from the roof, we have a wall and floor to replace, below you mention a good adhesive activator, would you have a specific adhesive activator that you would recommend? 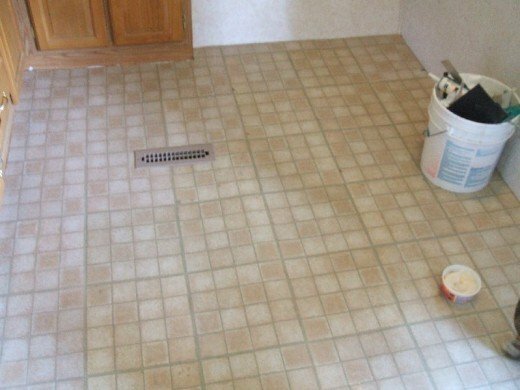 Gary, if you use a good adhesive activator before laying the tile, you won't have to worry about the temp variables. I'm wondering if using stick on tiles are the best way to go due to temperature extremes during the year. I get that they are easier to apply but do you sacrifice something else in return? Marty, thanks for the BDay wishes! :) Every day is something to be grateful for. Hi Randy! I just Googled you to find this article, and read yesterday was your birthday! Happy Birthday +1 Randy! Hope it was GREAT! Hi Marty, if you run into a problem, don't hesitate to contact me and I'll try to help. Good luck! I've been reading this article over and over almost ever since you published it. The time has come for me to be brave and just do it. My whole floor has to be replaced. I have a 1988 Toyota Dolphin which is already gutted. 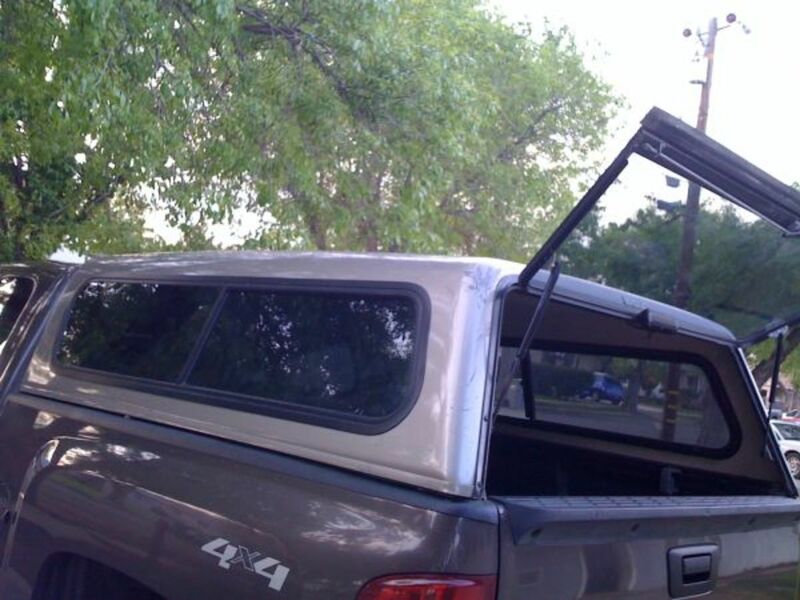 Know you're familiar with some Toyotas. Just wondering if you have any other crumbs of wisdom to offer. Thanks in advance. Great article btw. Roberson, I'm not familiar with the construction of your camper, but the walls usually are bolted over the existing floor. 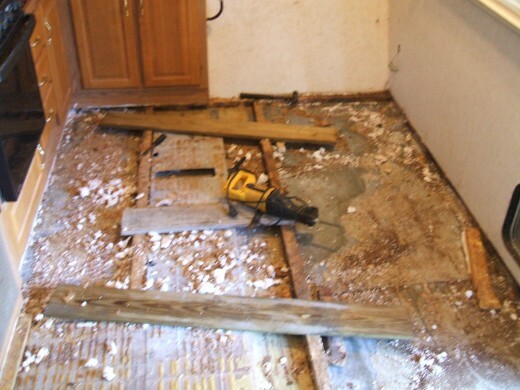 you may have to jack up the walls to replace the flooring. Ive just purchased a 2005 kodiak by thor. the floors are rotted out. I am a home builder so I feel comfortable tackling the project but my concern is the floor system and how the weight is distributed on the outer wall. 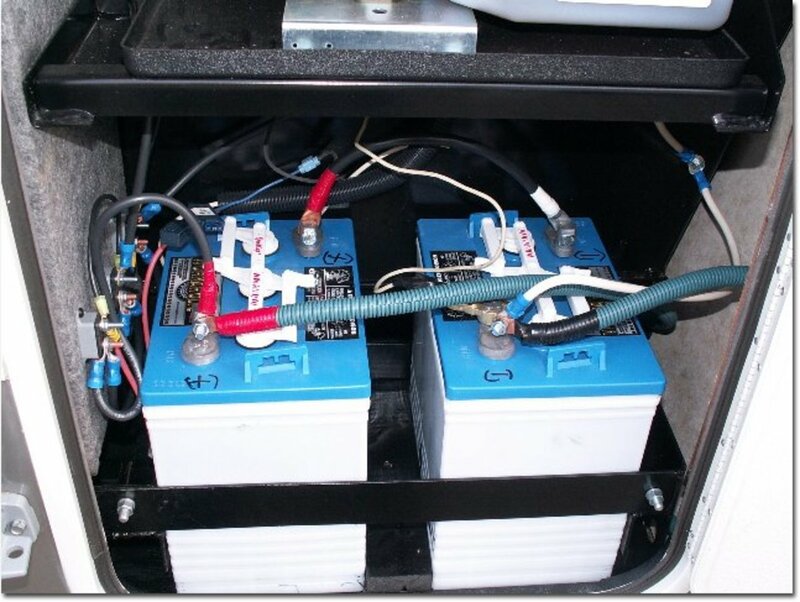 Furay, you may try looking at some of the newer materials used in today's RVs. Donald, they should be color coded. If not, you may have to use trial and error as I have no wiring diagrams. Dane, I don't know who Jessi is, but I'll try and answer your questions. There shouldn't be any space between the walls and the floor. More than likely the toilet and/or the sink has flooded the area before. Whether the problem is major or not will depend on what you find when you get a closer look at the damage. Newbe here. I just replaced the toilet in my 2013 Freelander. I bumped a piece of molding at the floor wall junction, and I could see daylight between the wall and the floor. Checked the other side of the RV in the bedroom area and the same is true. Can't find anything on Google about this issue. Do I have a major problem or am I just so new at this that I do not really understand how these things are put together? Jessi, I know there are many on the market and I have no experience with the newer wood preservatives. You'll have to do a bit of research or ask the people at Home Depot or Lowe's about your problem and the best treatment for it. Been out the business too long to give you better advice on this. Sorry! Could you recommend a good wood preservative? There are so many on the market that it’s hard to choose. Hi Jessi, sounds like you do have a problem. More than likely the pipes froze and flooded the camper causing the damage. The wall studs are very important to the strength of the camper. You may be able to add more studs to the side of the old ones and get by with them. There is a wood preservative and strengthener you can coat the old wood with and this should prevent any future damage. If the area under cabinets isn't very large you can probably get by without replacing it unless the H/W heater is resting on it. My husband and I recently purchased a 2004 Dutchmen with a soft spot on the floor by the back bunkroom. We are first time camper owners and did not do our research. We got it cheap and now we know why...water damage, major water damage. It almost looks like there was a fire and that part of the damage is from that...not really positive. We have ripped the floor out completely from the entire back room and have also taken out all of the floor joists so that they can be replaced. I have some questions and am hoping you have some answers! 1. We can see that the bottom of the wall where it met the floor is rotted out as well. Can we get away with leaving this rotted wood there, as long as it has not travelled up the wall and the leak is fixed, or will the rot spread to the new wood? I know that we can install L brackets to support the wall, but my concern is that the moisture from the wet rotting wood will spread to the new wood and cause that to rot as well. Will this be an issue? 2. We can see that the end of the joists that support the floor under the fridge/stove/cupboards area is rotted out. 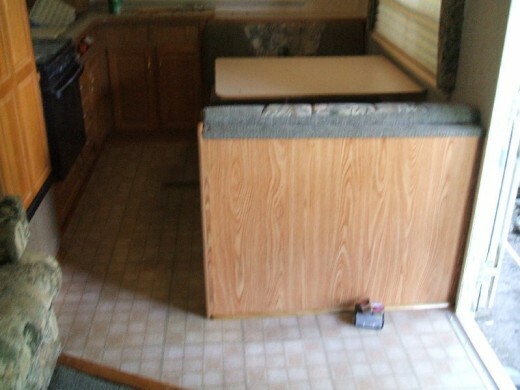 Because there is no foot traffic under the kitchen side, do we have to fully replace all of the rotted boards, or is there a way to get around that without compromising the integrity of the camper? 3. I think that what I am basically asking is do you have to remove all of the rotted wood or is there a way to keep the rot contained, so that it does not spread to the new wood that we are putting in? What are your thoughts on wood filler/strengthener or an epoxy? Hi Mike, I don't have any experience with using this type floor in a camper, but several people have told me they were going to. I haven't heard back from them on how it worked out. Hi Randy. 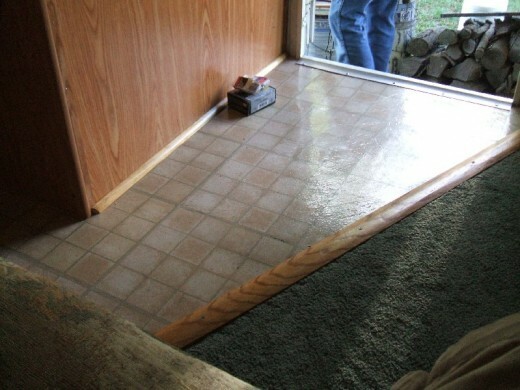 Do you have any experience with anyone installing that new floating vinyl plank flooring in their trailer? I understand they want you to glue it down if it will be exposed to temperatures below freezing, but I was wondering if you know of anyone who has any experience with installing this as a floating floor. Thanks. Mike, I don't see why you can't use this type of insulation if you prefer it. No matter what type of stick on ties you install, make sure to coat the floor with a good glue activation agent shortly before the application of the tiles. Good luck on the repairs and thanks for reading, Mike. Randy, I have a 2014 Heartland Wilderness. I had soft floors in bathroom, so I cut out a square in bathroom. The pressboard was totally soaked due to a leak in shower plumbing. I have gutted the bathroom and removed pressboard and foam insulation. I have added two new floor supports. Can I use polystyrene insulation for floors? Also can I use vinyl tiles bought from local box store for flooring? Any special tricks for installing vinyl in camper? I used pressure treated plywood, Stan. Didn't want to do this again in MY lifetime either. Michael, examine the old floor first and take a few pics if you're not sure about the reconstruction. Good luck and feel free to consult me it you run into problems. We have a columbus model 385BH 5th wheel with sagging floor. Can we repair this ourself and do you have any tips for us before we start? Marsha, having a metal covering under the floor is not a necessity, and is sometimes susceptible to holding moisture. If the camper roof is sound then the chance of the floor being exposed to moisture is very low. Thanks for such a great resource! I bought a Zeppelin Z310 recently to live in for a while and discovered after connecting and running water through the lines that there were several leaks (new and old). I cut away the splash guard under the RV to find no metal, only plywood, all of which appeared to have been wet for a loooong time. 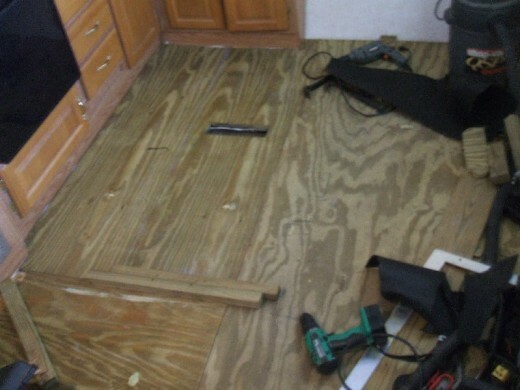 Basically, I have to replace the ENTIRE floor throughout 60-70% of the RV. Your instructions for replacing the floor show you had a metal bottom in your RV. Any advice on this repair job, given there's no metal and everything has to be replaced? Page, I don't believe there would be any advantage to having the trailer on jacks other than being steadier to work on. Maybe the wrong thread for this question, but can you tell me if we need to level our trailer on jacks or have it resting on tires to put all new siding on? Hey JSD, coating the hambox with a good wood preservative is the best way to go, but still I'd protect the exterior by storing it under a shelter during the off season. 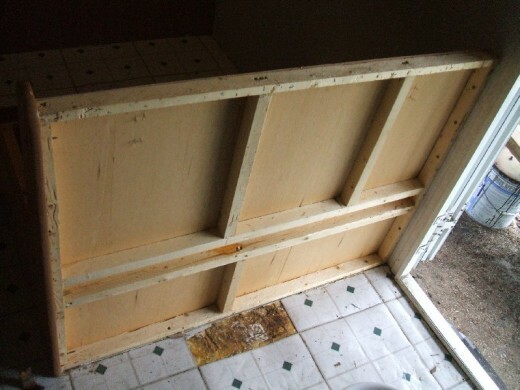 If possible, use PT or marine plywood for any replacement of the old materials. Hey! Great convo below. I'm redoing a 1965 Forester 14' and I have been doing the same jacking the shell off the frame to fit the floor properly underneath. The whole floor was rotten. The next project is going to be removing the interior AND exterior walls for the purpose of going all wood. Eventually I'll get to my question... I want to use 1/4" tongue and groove both interior and exterior. The exterior is my concern. I was thinking about laying out tar paper over the top of the frame and overlap over the sides some. As I connect the boards I'll lay a bead of clear silicone between them. Then I'll finish the job with deck waterproofing stain. My question is - will that be enough to prevent water damage in the future? Or should I go crazy with sealing it? Also, it appears some of the edge framing is made out of some junky oldschool plywoodish material and it's not in the best shape. What do I do about that? It's in the canned ham style so I am concerned about getting it right to shape. Mark, I usually add some "L" shaped steel brackets along the exterior walls and to the new flooring to increase the stability of the walls when traveling. This allows one to simply replace the flooring up to and not beneath the walls. Randy, great article, thanks for posting. I recently replaced almost my entire floor in a West Coast Trailer toyhauler which had many weak spots due to water intrusion. The roof appears to be recently repaired, so I assume the damage has developed over time. I used a toe kick saw to cut the flooring away from the walls, and replaced with some 5/8 plywood coated with Thompson's water seal on both sides, to offer some protection in the future. My floor is now nice and solid, but I'm wondering, have I compromised the structural integrity overall ? All appears fine sitting in my driveway, but rolling down the road at 55 mph is not when i want to figure out there's a problem ! I wonder if I should have jacked up every wall and laid the new flooring underneath it. That would be a huge job, but much easier now than later..
Maryann, you'll have to remove a section of the bad flooring to see how much area to remove. There's no easy way to tell unless you have the specs from the maker. Hi Mary, your husband is right, this is a time consuming and often labor intensive repair job. Nevertheless, if you have the time and energy you can repair the floor yourself. As for the floor under the walls, you can simply go right up to the walls with the new floor as long as you add some L shaped steel brackets to hold the walls down to the new floor. Good luck! our floor is rotten including the side areas under wall how do we replace this with new floors. The are from bath room is most likely bad and extends to area under fridge cabinet and stove most likely so should we remove them and do whole flooor or just rweplace up to this area. Iam beside my self husband says we cant do that i say we can still unsur about the rotted wood along camper edge? Mikai, what info do you require? Wayne, the only way to replace the floor joists under the walls is to jack up the walls one section at a time. I assume you have aluminum/Styrofoam sandwich type material used for the walls. Just be sure to use plenty of "L" shaped brackets to securely reattach the walls to the new floor. I have an 89 Play Mor. The floor in the bedroom is completely rotted out. How do I replace the rotten joists under the walls? The joists under the walls are in extremely bad shape. I have a 09 hideout . The slide out has been leaking all winter long which has warped my floor under my slide out and under my counter which has caused the counter to raise up . is there a way to take a section of my counter out so i can cut the old flooring out and replace it ? Hey Deb, try looking on EBay at campers for sale. There are usually some old ones with pics of the interior inmost cases. Hi RANDY just bought a 1977 Jayco trailer how do I find out the original design as several have pondered in it How do I obtain pictures? Kimber, you may have to use a strip of carpet to cover the area where the slide comes in. I have little experience in using stick-on tile in slide-out applications of this sort. Sure! Thanks for asking. I put down vinyl stick tile on the flat part of the slide and now am putting on the repaired part of the main floor. The transition, or mechanics where the slide comes in ( the metal black hump that the slide comes over when we bring in the slide) is what I don't know how to cover. It was originally carpet. 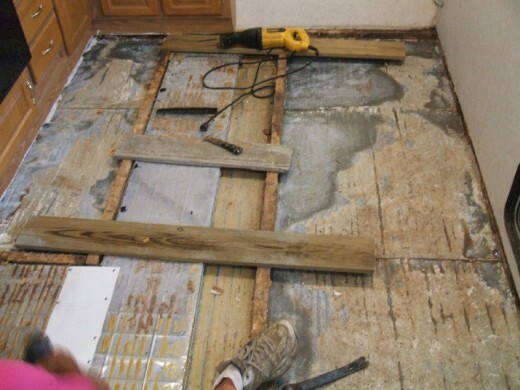 I have seen where some who used laminate flooring put a transition board. However the peel and stick is only 2mm thick. I think if I put another piece over the transition it would just roll up or break when we pull the slide in. Hi Kimber, I don't understand your question. Can you give me a bit more info? Hello Randy! I am replacing the flooring in my 2006 Crossroads Zinger. My husband already did the hard part of tearing out old floor and replacing (using some of your tips). My question is when using stick on vinyl plank how do I cover the edges of the slides? Thanks! Chris, it depends on how your slide-out is constructed. There are several different types of construction used in slide-outs. Hello,I have a traveling trailer and the slide out in the living room floor has water damage How is the process to fix this?. Do I have to disconnect the arms that hold the slide out or it can be repaired without disconnecting it. I was taking a trip with my family this past summer and we used a trailer. It was so fun! We had nice breaks and were able to get to so many places and have some great bonding time. I would do it all over again, but maybe next time rent a trailer that was more up to date to see what features were available and to make it more comfortable. Hi Gerald, yes it is much better to replace the floor under the walls if possible. If the new floor only goes to the wall instead of under it then L shaped steel brackets are required to attach the walls securely to the floor for added strength. BGE--It may be easier to work from the inside rather than having to remove the exterior metal panels. Is there any way to place a wooden support in the corner? If so, you may be able to jack up the corner enough to replace the support. Have you considered using thicker plywood to support the corner? Feel free to ask for more info if I'm not understanding the problem correctly. About how much would that cost to do on a 22 foot trailer? Brenda, you may have to drill some holes into the bad places in the floor to determine what wood needs to be replaced and what thickness the replacement flooring needs to be. Then you can figure the materials needed for the repairs. Feel free to ask for more info if needed. What can I do to figure out how much damage and the amount of flooring I will have to replace? Carol, we didn't go under the walls but used plenty of L-shaped steel brackets to attach the walls to the new floor. We added floor supports around the edge of the walls for the new floor to attach to. The bottom of the brackets are screwed to the floor while upper part of the bracket attached to the wall. Hope this helps! Can you explain to me how you attached your floor to the walls. Talking to an rv guy and he said we would have to get the new floor under the walls of the camper. Seems like an impossible task. Hey Carol, yes I'm aware that some campers have very few floor joists to support the floor. Welding extra beams to support the floor would be great if you cannot add joists any other way. Any way you can add extra supports to the floor will be fine. We have an o4 Jay Feather Exp. The floor at the front of the camper is rotted. We have taken much of the old composite floor out (where it was rotten on both sides of the flooring) down to the outer membrane. As you are aware, these trailers have no joists to lay a new floor on. Not sure how you added your extra floor joists. You mentioned clamps but not sure where you put them. We can add a joist running across the floor over the metal under the trailler that runs the length of the trailer but how do we attach from front to back. There is a joist in the front of the trailer and one about 3/4 of the way down. We are thinking about having a welder add extra beam across the trailer so the joists we add from front to back have some support under them. So confusing for novists. Hi Pat, if you can replace the bad flooring from the topside then I'd suggest you do so. As you can see in this article, we added more floor joists than was originally used in the floor construction. 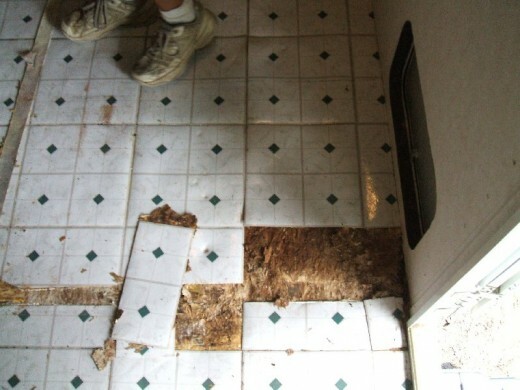 In my experience, these Styrofoam and luan floors will eventually degrade over the years so it's better to use a more reliable flooring material during repairs. If the flooring underneath the cabinets is solid I would merely replace the damaged areas up to them. Ask for more info if needed. Hi Randy, I have a 07' Aerolite cub 160 that I have kept dry for 3 years but the floor was wet in several areas when I purchased(i presumed from lack of maintenance and from sitting outside). I already had to repair floor(from underneath) where folding step was partially supported from styrofoam floor(bad design). I accomplished this by replacing luan and panning that corner of floor with aluminum and added a little square stock(like factory) to support entry step which the factory should have done. But hears my question: The floor is getting soft now further in and got the dreaded purple spot in vinyl and not sure how to attack this from the top(inside camper). Do i remove all rotten luan and styrofoam up to cabinets and walls then add wood joists between frame rails or what? Do you think theres a way to just add said joists(or plywood) between frame rails from underneath and leave styrofoam in place. Then remove the vinyl and replace any loose luan and then put down new floor covering. I guess all this is dependent upon how much damage is there and accessability to supporting from underneath. I cant really see how they support the floor other than 4 pieces of angle iron attached to frame at each corner(really?) or do the tanks hide more? Hello Michael, if the leak is stopped I'd simply keep an eye on the area in question and wait and see for now. It may be okay to leave it since it's in a place where foot traffic won't further degrade the area. Sometimes it's simply easier to let things be for awhile. Recently purchased my first used trailer (24') and I have found that the floor is soft along the wall under the stove and sink area. (approx. 10' x 1') The good news seems to be that it is an area where there is no foot traffic. The bad news seems to be that replacing it will be complicated and more expensive because of the location. If I can determine that the cause of the leak has been fixed, will I be able to live with the damage or is it just going to get worse? Hi Dan, I'm not familiar with that model so I cannot advise you on the construction methods used. I'd be interested in seeing some photos of it if you have the time. Looking at completely lifting a 2001 r-vision B17 hybrid body off. Ever seen or dealt with the aluminum frame / construction of these? Hi Janice, I'm sorry but I cannot advise you on asbestos related products used in your camper. I do not have the expertise required to help you in this matter. Sorry! What about asbestos? I had my 1979 flooring tested (did myself) and there are two layers of linoleum. The backing of the top layer is 50% Cyrstaline asbestos. So now, I don't know what to do. There is a soft spot but I don't have the funds to do an asbestos floor removal. And what about the loose linoleum that has asbestos backing that is lying loose under the bedding? I really don't know what to tell you without seeing it for myself, Bev. I'd simply go ahead with the tile and let the kids worry about it. Sorry I can't be of more use to you than this. Hi Bev, is the problem that you can't find any tile thinner than the carpet you removed from the slide-out? Am I understanding your problem correctly? Hi Janice, I've never encountered asbestos in any flooring job. Repairing the floor in a Serro Scotty shouldn't be a big job because of its size. Hi, what about asbestos in the flo0ring? I just purchased a 1979 Serro Scotty with two layers of linoleum and needs to be pulled up. There is a soft spot in the center of the floor. Hey Kristin, it's really hard to give you reliable advice without personally examining your camper. One needs to do their homework as far as figuring material and labor costs before attempting floor repairs. 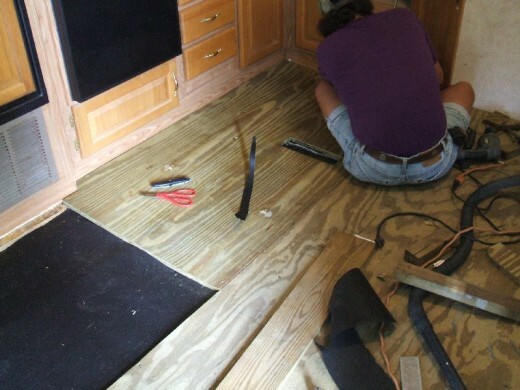 Tearing out a small portion of the damaged flooring is the only way to see what is required for the repairs as each camper is somewhat different than other models. Wayne, you have to remove a small section of the damaged floor to see how it is constructed. 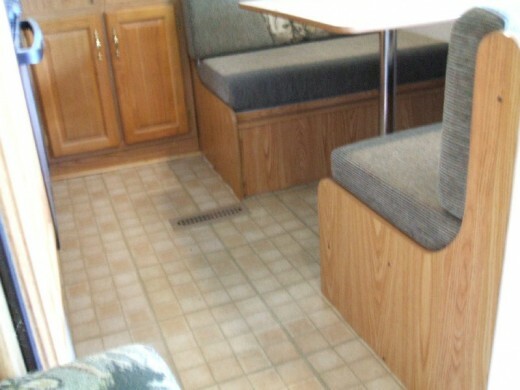 Every RV seems to be a bit different as to the construction of flooring. I was wondering what you used to secure the walls to the floor. Did you connect brackets to the wall studs and to the 3/4" plywood? Thanks again for your help. Thanks so much for your quick reply!! This job has turned out to be way more work and thought than anticipated! I was actually concerned about the walls as they appear to be sagging slightly. I have used floor jacks on the outside to secure the wall before I go on to add joists, it just seemed like a good thing to do. Thanks again and keep up the good work. Hi Cory, you have to wing it as far as adding new joists and brackets to the floor and wall are concerned. I fastened the brackets to the new floor surface--in this case it was to the one inch treated plywood I used as replacement for the previous floor. We also added extra joists to support the new floor better than it was previously. The brackets are a necessity in order to anchor the walls to the floor so do the best you can to do this securely. Feel free to ask for more info if needed.